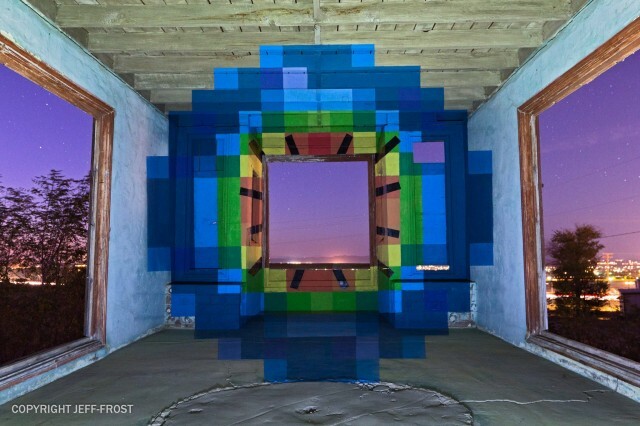 “Flawed Symmetry of Prediction” is an experimental film that combines 3D illusion paintings and time-lapse to mesmerizing effect. Artist Jeff Frost created the film and a free companion eBook. Frost is now working on a follow up film, “Modern Ruin” (trailer). As the shadow of night falls across the American West a lone man begins his work. Far from the confines, calamity, and culture of society, multimedia artist and storyteller Jeff Frost sifts through the visual dregs of places and people who once were. Combining still and time-lapse photography with motion, music, and art, Frost reveals a world rarely seen. Rooted in science and the exploration of space, Frost’s work explodes with light, fire, and sound, utilizing 2D and 3D perspective, leading the viewer on a unique visual journey through worlds both real and imagined.